It has recently been confirmed that Bai Yun, a giant panda living at the San Diego Zoo (on loan from China’s Wolong Giant Panda Research Center) is pregnant! An ultrasound showed that Bai Yun is currently carrying two fetuses, so it is possible she will give birth to twins. Giant pandas are highly endangered in their native habitat of southwest China. To learn more about giant pandas in the wild, see Animal Fact Guide’s article: Giant Panda. 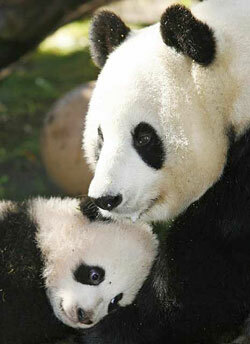 For more info about Bai Yun, see LA Times. This entry was posted in Animal News, Animal Photos, Baby Animals, Endangered Species, Zoos and Aquariums and tagged endangered animals, giant pandas, san diego zoo, Wolong Giant Panda Research Center by admin. Bookmark the permalink.